I am cracking up at a pair of red bellied woodpeckers who have started coming to the feeder. They must have a nest with chicks. My feeder is a wooden box of sorts, turned upside down on top of a stack of concrete blocks. They perch on the side of the blocks and make a terrible racket while scoping out the ground next to the feeder. Then they hop down, grab a big chunk of bread and fly off. One literally carried off half a biscuit yesterday. lol @ the woodies. They are something! We finally had our first hummer yesterday, woohoo. I had a good bird morning, this morning. I was working feverishly at my computer, had not peeked at c-d in quite some time, looked out my office window and saw a red male cardinal sitting on my platform feeder right next to a.... male indigo bunting! I rarely ever see those. There are just little things in life that please me no end. I love those cardinals-what does a bunting look like? 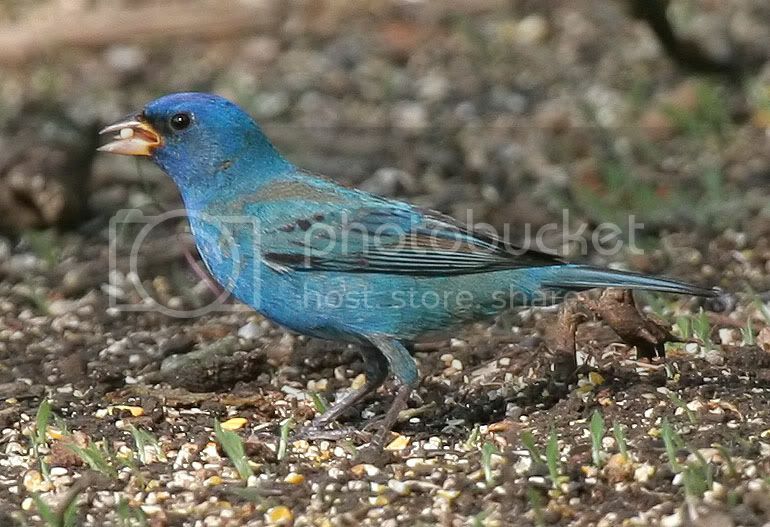 Indigo buntings are really something, I have seen a couple in the springtime since moving here. And being from Colorado, I still get a shiver of excitement every time I see a cardinal--you really got a double whammy there, Ellie. Man you guys have it made. That is a nice shot! Yeah we do. Don't you have snowy owls or something up there? Yes we do up here on the north slope. But we don't get the cool colored birds like you guys down there. I think the most colorfull is the stellar jay. A nice deep iricandesant blue, and a black head with a crest thingy like a cardinal...I don't have a pic handy. What kind of falcon is it? I enjoy watching raptors. As for our blue-colored birds, they're not that common. Blue jays are. Must be like your stellar jay. Eastern bluebirds are on the rebound. I have a pair who come to my bird bath every day around 4:30. But the Indigo Buntings are few and far between. I'd never seen one until last year. I have no idea what kind of falcon it is. Could be a perragrin or gyr falcon. Pretty tiny thing. But really cool to watch while it sits there resting. All birds and squirrels vanish but come right back out when the falcon leaves. But the Indigo Buntings are few and far between. I'd never seen one until last year. And Rance, I did not take that pic. I wish! It came from Photobucket. 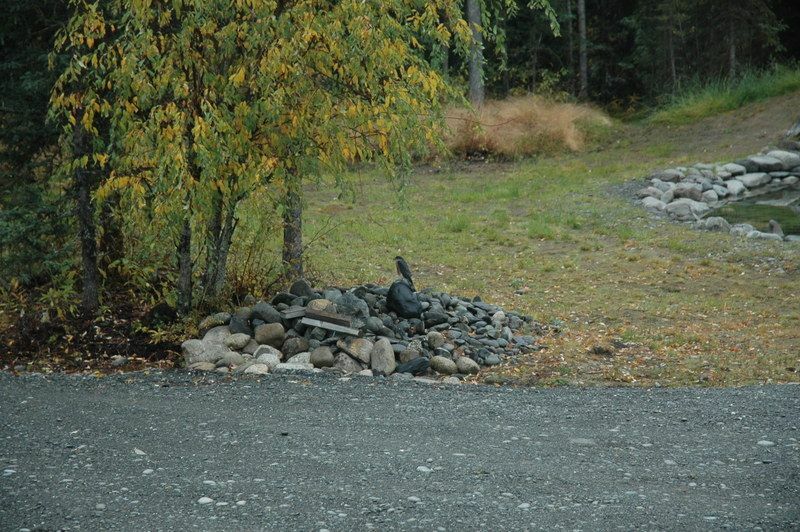 I've taken photographs of the indigo buntings I've seen, but they were just little indigo blobs in motion. I've been seeing lots of bluebirds, which to me, from the rear, are almost more exotic looking than the indigo buntings--the males, that is. The blue is so bright, almost snowcone blue. I like raptors, too.Yesterday while out on the school playground (which overlooks the bay), I watched an osprey fly off with a fish in its talons. Have been seeing a bald eagle family regularly at the beach; two adolescents, and Mom and Pop. I do have pics of them that I will eventually post. Maybe some migrate, and some don't?